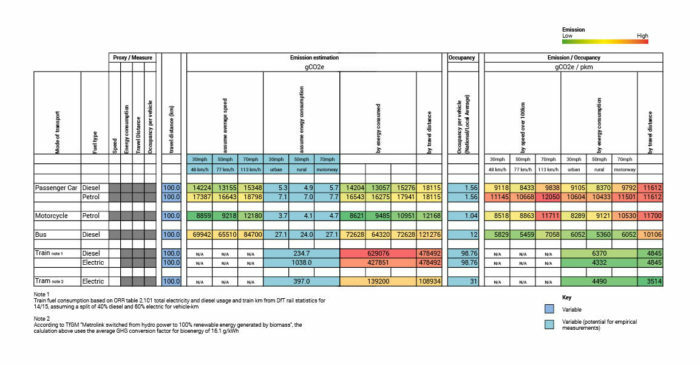 This report investigates occupancy/emission metrics for public and private domestic urban transport and develops an emissions/sustainability matrix for the future development of a ‘Green Travel Planning Tool’. 1. Review the current methods of estimating occupancy/emissions for various modes of transportation and to update these for accuracy. 3. Compare the metrics developed with results from existing journey planners producing their own estimates. Existing journey planners providing emission estimates typically use distance, estimated travel time and different modes of transpiration as factors. The matrix produced here incorporates multiple additional factors (e.g. travel speed, embodied energy use based on fuel type) in an attempt to accurately estimate emissions per journey. 3. Identification of measurements and variables required for emissions and occupancy estimates. 4. A dynamic matrix that can be used to compute emissions results for new journey planners.